One of the most treasured buildings in Northern Kentucky will soon have its second life. On Wednesday night, the Bellevue City Council approved a memorandum of understanding with a developer who has a proven track record of restoring historic buildings and fitting them with successful business models. The City of Bellevue, recognizing the 1940's art deco building's importance to Fairfield Avenue, opted to purchase the Marianne for $138,000 in May of last year. 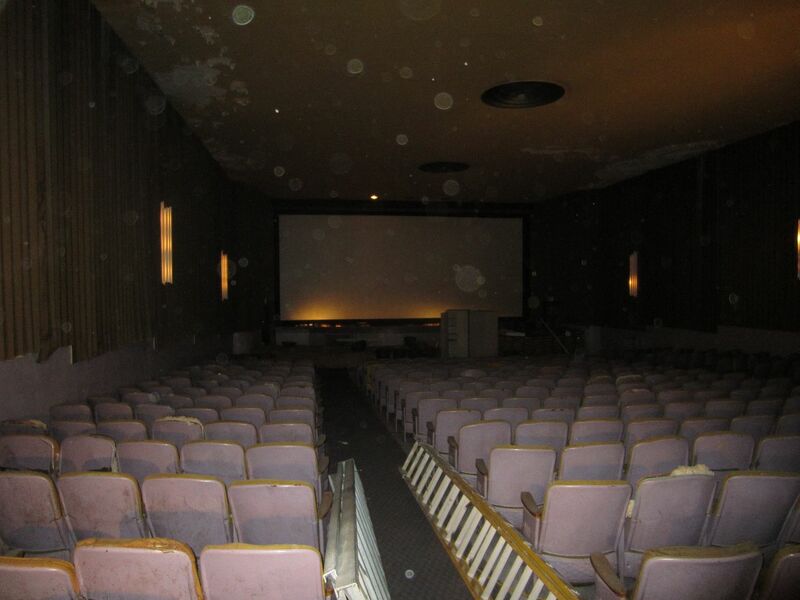 In the fifteen months since, the city has hosted an open house that drew a large crowd of curious spectators to the theater that has been closed since the turn of the millennium, pursued and received placement of the theater on the National Register of Historic Places, and heard an expert opinion that the estimated cost to redevelop the site would be $1.6 million, and also welcomed a Hollywood film shoot when The Blunderer, starring Jessica Biel and Patrick Wilson, was shot on Fairfield Avenue in front of the theater. And now, the most important news of all: that the Marianne will, at long last, have a new life, a new life that started in motion before the city even purchased it. "I remember driving Fairfield Avenue two years ago and I saw the Marianne and I pulled a u-turn and said, what in the world is that? The front of the building is so cool. I think it's one of the coolest front of a building I've ever seen," said developer Kent Hardman. His passion for old theaters is evidenced by the renovation of the old Jackson Theater in the Cincinnati neighborhood of Columbia-Tusculum. Another high-profile redevelopment under Hardman's belt is a former firehouse in Cincinnati's Walnut Hills which now houses Fireside Pizza and his personal residence. Next up for Hardman: the Marianne, that stunning piece of local movie history that captured his imagination two years ago just as it has so many others' over the years. "It's just been a bunch of random little life incidents that have happened to get me to this point," Hardman told The River City News. "I was randomly on Facebook a year ago and saw Bellevue bought the building so I reached out to (assistant city administrator) Jody Robinson and she gave me a tour. It's so cool. The building is like going back in time. It hasn't been disturbed." While the Marianne Theater still very much looks like the one-screen movie house that it was for sixty years, Hardman's plan is to create a brewery at the site, retaining as much of the cinematic functionality of the space as possible, including its sloped floor, movie screen, and iconic marquee. "The thing that motivates me is getting these historic buildings and keeping the facade and keeping as much of the original as you can and using them for modern day purposes," Hardman said. Specific details on the brewery are not yet ready to be released, he said, but there will be a partnership with an established brewer in the area. There is also no name yet for the project. Instead, the next steps involve developing a fully fleshed out plan with accurate financial projections, architectural drawings, and engineering analysis. The agreement with the city affords Hardman the time to pursue those pieces of the project before a sale is finalized. "It shows the city's commitment so that then (Hardman) knows it's worth his investment to go to the next stages for the refined development to bring in engineering firms to look at the structure, and to have more detailed designs so that he can put together pro formas to go to bank financing," said Robinson, also the city's Main Street Manager. The project as proposed, Robinson said, is exactly the type that the city had in mind when it purchased the building last year. "The city purchased the building in order to increase the ability to see that it will turn into something that creates vibrancy, economic development, preserves the historic structure, and ultimately also allows for community engagement within the space." Community use of the new development will be a significant piece of Hardman's plan. "I promised them it will be a community gathering place, too. If kids want to have a play there, I would totally be open to ideas like that," he said. The Catalytic Fund assisted the City of Bellevue in marketing the request for proposals from developers. A committee was put together to evaluate the proposals that came back, but Hardman's stood out. "We are extremely excited for Bellevue," said Joe Klare, manager of real estate finance and investment at the Catalytic Fund. "We think it's a huge investment in Bellevue's Fairfield Avenue. It's something that is going to continue to revitalize Fairfield Avenue and draw traffic to that end of the city. (The Marianne) is one of Bellevue's largest commercial footprints. We're confident that the brewery group will be putting together a great project." Adding another brewery in a region in the midst of an industry boom may lead to questions of over-saturation. But those involves on all sides of the proposed Marianne project believe that the volume of breweries in Northern Kentucky and Cincinnati will only benefit the community's economic growth and tourism appeal. "We think it's going to be comparable to the Bourbon Trail," Klare said. "Having a critical masse of those types of draws invites people to stay for the day." He suggested that people would be able to visit Eight Ball and Darkness breweries in Bellevue, Hofbrauhaus in Newport, and Braxton Brewery in Covington, all in the same day. "It creates a great environment for tourism and creates an experience like Portland or Ashville (North Carolina) where they have tons of breweries." "I hear a lot that it's becoming saturated," Hardman said of the brewery scene in the Cincinnati market. "I'm a firm believer that the direction of breweries is going to be more community-focused and years from now there will be a brewery in Bellevue, in Oakley, in Pleasant Ridge. I don't believe they are saturated at all. I do believe it's getting more competitive. What I mean is, talking specifically about the Marianne, is, one, it's a cool building which will draw people. And two, there will be beer there and people love to drink. There is a movie theater there and we want to tap into that and use that movie theater with maybe a cult movie night or something, so there is programming at the movie theater, making it more than a destination where you drink beer." He cited Braxton's multifaceted approach that includes work spaces for professionals and coffee served at the bar in the mornings before the beer starts flowing. "There are going to be other things that we have to offer and we plan to do that at the Marianne." On Wednesday evening, city council also saw a presentation by the Greater Cincinnati Energy Alliance that detailed the Energy Project Assessment Districts (EPAD), a program that is new to Kentucky and has so far only been adopted in the state in Covington. Bellevue is expected to become the second city to implement the program which would benefit commercial projects like the Marianne by offering developers the opportunity to finance energy efficiency and renewable energy improvements through the energy savings. "We are excited the process has delivered the intended results. The proposed use is contemporary and sustainable," said City Councilman Ryan Salzman. "The developer has a proven record of preservation. The continued growth of Bellevue depends on the development of the Marianne." Robinson said that the city and Hardman's team, which inclues WorK Architecture + Design and Furlong Building Enterprises, share a passion for the project, only bolstering its possibility for success. "They love it as much as we do," Robinson said. "They are so excited about this building."